Some buildings are designed to take a hit. Data centers, embassies and government buildings are just a few examples of those built to withstand manmade or natural destruction. Increasingly, however, the design of community-oriented spaces like airports, schools and religious spaces is reflecting the need for security, too. The challenge in those cases, of course, is to not make it look too obvious. "A data center is basically a concrete box, so it has more inherent protection than other structures," said Eve Hinman, president and founder of San Francisco-based Hinman Consulting Engineers, which offers protective design services. "You don’t want to not have windows in a church or a school." Can beautiful buildings be strong? The question of whether today's public buildings can be visually appealing and secure was sparked by Philadelphia-based architecture firm KieranTimberlake's design of the new United States embassy in London. The price tag for the new building, which anticipates 1,000 visitors a day when it opens later this year, rang in at $1 billion. The building's construction marked a transition in how the U.S. builds its embassies. In 2001, the State Department's Overseas Buildings Operation (OBO) revamped its embassy construction program in response to international terror attacks. The new program focused on creating standardized templates using design-build with a select stable of contractors in the hopes of making it easier to build secure sites. In 2011, OBO transitioned back to a design-bid-build process, which it called the Excellence approach. That meant embassy design was once again a one-off endeavor, something advocates thought would help ensure that the site was secure and a welcome representation of the U.S. abroad. 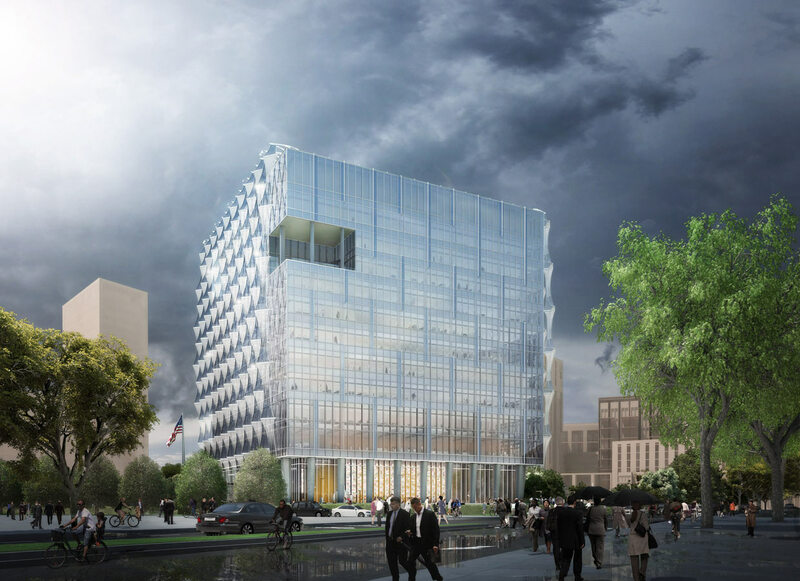 A rendering of the new U.S. embassy in London. KieranTimberlake put the main embassy structure at the center of a civic plaza and park that contains a pond, walkways, seating and landscaping. These features create natural, unobtrusive barriers that also meet security requirements, according to the firm. A significant portion of the site is devoted to public space. Another recent example of durability in design is the new school built to replace the 1950s-era Sandy Hook Elementary School, in Newtown, CT, where in December 2012, a single gunman shot and killed 20 students and six adults. The firm chosen to build the new structure, the New Haven, CT–based Svigals + Partners, used input from stakeholders like parents, students and teachers to drive the design process, Architect Magazine reported. The resulting building, which opened last year, mixes playful embellishments like colorful glass and cheerful artwork with security-driven details such as a clear line of sight for the three paths by which the building’s main entry can be approached, as well as terminal-like classroom wings. The U.S. embassy in London and the new Sandy Hook Elementary School reflect what New York–based architect Barbara Nadel calls "transparent security." That can concern everything from the core and shell to the interior layout to landscaping. In response to the events of 9/11, designers studied structural systems to better understand how buildings could fail under threat. They looked at the locations of windows, doors and other means of egress; fire protection systems; emergency lighting; and mechanical rooms. They also looked at redundancy to ensure continuity of service in case one point in the system was cut off. "Eliminating the possibility of a single point of failure in any major building system must be carefully considered, regardless of the nature of the threat," she said. Nadel is the author of "Building Security: Handbook for Architectural Planning and Design" (McGraw Hill, 2004). "Eliminating the possibility of a single point of failure in any major building system must be carefully considered, regardless of the nature of the threat." "While concrete is our go-to for design, you can certainly include windows in concrete buildings and still be secure," Hinman said. While blast-resistant window panels and curtains can protect occupants and let light in, many owners, including schools and religious facilities, can’t afford them. For those projects, she recommends mesh safety screens and curtains, which keep shrapnel and glass out. Hung in the window just as fabric curtains are, they also let natural light in. "There are all kinds of products out there to stop fragments," Hinman said. "The fragments usually are more hazardous than the blast itself, particularly for a school or a church, where a bomb may be relatively small." Blast-protective wall and door panels from companies like Armortex and Anchor Modular Buildings can be incorporated throughout a building as well as at entry points or other vulnerable areas, Hinman added. Some of these panels also include sensors that can detect objects like a gun or a bomb and then trigger an alert. Schools, for example, have successfully used these kinds of panels to build structures in classrooms that look like cabinets. Students can hide in them and be protected if a shooter enters the building. Where security is concerned, subtlety is key. Designing interiors with wide, open spaces — particularly around entryways — is one way to enhance security without needing to fortify. Corners should be few and within sight of administrative offices and gathering places where people are always present. That allows unusual packages and other behavior to be immediately seen and reported. Although security-driven design decisions should blend in with the surrounding environment, some observable safety mechanisms can help deter violence or other crime. That can be achieved through "visible alarm systems, a well-lit perimeter as well as an always-lit interior, a well-maintained facility that speaks to building owners' awareness of 'the lay of the land,' and the regular presence of local law enforcement in or near the grounds," Nadel said. Other security measures Nadel advocates include entrances and vestibules located where visitors can be easily monitored and viewed from within the building and on the grounds. Use of CCTV camera technology and trimmed landscaping that limits potential hiding spots are also effective. These types of unobtrusive — or, transparent — security measures were incorporated into architectural firm Leo A Daly’s recent redesign of the 750,000-square-foot, $300 million Intelligence Community Campus located just outside of Washington, DC, in Bethesda, MD. A Z-shaped structure connects a new intelligence building with three existing ones. Research has shown that exposure to natural light throughout the workday can improve performance, and the result is being reflected in new office construction nationwide. For that reason, says Leo A Daly Associate Architect Andrew Graham, the firm included ample, blast-resistant glazing on the new main building at the campus. That allows light into the space but ensures the windows won't break into shards in the event of a nearby blast. After all, Graham said, it's important that employees don't feel like they're working in a bunker. Prior to the renovation, the 16 intelligence agencies sharing the facility were housed across three, 1940s-era buildings. The new 220,000-square-foot, Z-shaped building links those structures and a parking garage via walkways and an elevated bridge. The existing structures were upgraded to be more resilient and were re-clad for a cohesive look across the campus, which is more akin to a college or university than to a government intelligence facility. The new building contains the site's main entry lobby, a cafeteria, a fitness facility, an auditorium and several levels of secure office areas, IT rooms and meeting rooms. From a design perspective, its primary role is connecting the existing structures, says Bill Baxley, now a managing director at Gensler, who worked on the project as design director of Leo A Daly’s Minneapolis office. He calls it a "stitch" that pulls the fabric of the campus together. Going forward, design professionals will continue to merge transparent design strategies, new materials and other building technology to make security appear seamless, Nadel said. After all, Hinman said, concepts like security, accessibility and openness needn't be at odds.